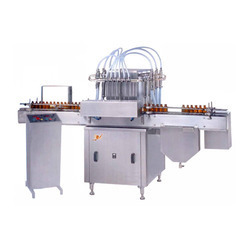 Pioneers in the industry, we offer injectable liquid filling machine and liquid filling machine from India. 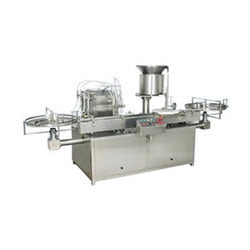 Injectable Liquid Filling Machine offered finds extensive use in pharmaceutical industry sector and provides automatic solution for high-precision vials filling. Further, the available advanced PLC program control as well as intelligent electronic control technology also assure of reliable working performance delivered by the system. Some of its features include simple and easy to handle user interface; no bottle no filling safety support; quality 304 stainless steel based finish; can be used for filling vials of 2 to 20ml; high production capacity; filling precision of ≤ ± 1% among others. Liquid Filling Machine offered can be made available by us in different operating configuration choices and provides for smooth process working support. Further, the system can be conveniently integrated with bag making, measuring, sealing cutting and counting system and can be automatically operated through setting parameters in intelligent PLC control support provided in the machine. Some of its features include stainless steel cover meeting GMP standard; allows for automatic adjustment of pouch size and filling range; equipped with Nitrogen and air filling system; all functions displayed on digital screen among others.